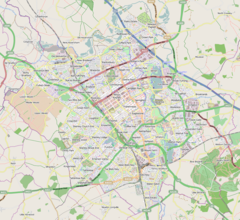 Central Milton Keynes is the central business district of Milton Keynes, Buckinghamshire, England and a civil parish in its own right, designated as a town council. The district is approximately 2.5 km (1.6 mi) long by 1 km (0.6 mi) wide and occupies some of the highest land in Milton Keynes. It contains (behind the Central Library) the historic site of the moot hill for Secklow (or Sigelai) Hundred. It contains the central retail, business, law enforcement and governmental districts, Milton Keynes Central railway station and around 2,000 residential dwellings. Occupying 238 hectares (590 acres),[needs update] the area lies between Portway (H5, A509) to the north, the West Coast Main Line and A5 to the west, Childs Way (H6) to the south and the Grand Union Canal to the east. It is crossed from north to south by (in west to east order, major roads only) Grafton Gate (V6), Witan Gate, Saxon Gate (V7) and Secklow Gate, and Marlborough Street. It is crossed from west to east (in north to south order, major roads only) by Silbury Boulevard, Midsummer Boulevard and Avebury Boulevard. Midsummer Boulevard is the primary spine. Campbell Park, stretching from Marlborough Street down to the Grand Union Canal, is part of the parish. While still on the drawing board, planners noticed that the main streets near the proposed city centre would almost frame the rising sun on Midsummer's Day. They consulted Greenwich Observatory to obtain the exact angle required at the latitude of CMK,[b] and persuaded the engineers to shift the grid of roads a few degrees in response. This area is almost[c] the highest point of Milton Keynes and includes the site of the moot mound (meeting place) for the Anglo-Saxon Secklow Hundred just behind the library. The area is defined by the Marlborough Street (V8, B4034) to the north-east, the Saxon Gate (Saxon Street, V7) to the south-west, Portway (H5, A509) to the north-west and Childs Way (H6) to the south-east. The core retail district is further delimited by Silbury and Avebury Boulevards, with civic and office developments outside the Boulevards. The retail district includes thecentre:mk and Intu Milton Keynes (the covered high streets that are the Central Milton Keynes shopping centres). the Central Library, Milton Keynes Council civic offices and other commercial offices are on the north side of the shops; the theatre, art gallery, Theatre District, the Xscape building (see below), pubs, sports shops and other leisure facilities are on the south side. Xscape is the main leisure complex in Central Milton Keynes consisting of SnoZone, a real snow indoor ski slope, climbing wall and a multiscreen cinema, and a number of shops, restaurants and night clubs. At the rear of the site is iFly, the first publicly available indoor skydiving column in the UK. The 1,400 seat Milton Keynes theatre/concert hall has an unusual feature: the ceiling can be lowered closing off the third tier (gallery) to create a more intimate space for smaller scale productions. It is the most successful regional theatre in the UK outside of London and operated by the Ambassador Theatre Group. Milton Keynes Gallery (the municipal art gallery, beside the main theatre) does not have a permanent collection. This allows it to host edgy shows to critical acclaim. This area is also delimited by Portway and Childs Way. Saxon Gate separates it from the north-east area and Grafton Gate (Grafton Street, V7) marks its south-western edge. The domed Church of Christ the Cornerstone, law courts and police station are in the business district, which has a number of notable buildings including CBX (central business exchange), The Hub:MK and the purpose-built Indian restaurant called Jaipur beside the small linear Grafton Park that provides its core. This ecumenical church, the first such in the United Kingdom, is shared by the major Christian denominations to serve the office workers and the small resident population. (There are many denominational places of worship elsewhere in Milton Keynes). The Hub:MK, home to several businesses and a trade centre along with apartments, flats and two hotels. The Hub:MK is a 2006-built development between the station and the church, consisting of towers ranging between 10 and 14 storeys. The complex includes two high-rise hotels and a number of residential and office towers set around a central piazza. The site controversially involves the closure of one of the original pedestrian underpasses and is built right up to the edge of the adjacent boulevard, the first of several proposals that would have changed the unique character of Milton Keynes Development Corporation's original design for Central Milton Keynes. The work is part of the 'densification' plan that central government, through its agency English Partnerships, had ordained for Milton Keynes. Its height, also a major departure from the original low-rise design, makes it the third tallest building in Milton Keynes, beaten only by the 14-storey Xscape and the 18-storey Mellish Court in Bletchley. To the south of the Hub lies a similar development named Vizion. This is similar in height and layout to the Hub but features a large Sainsburys supermarket taking up the lower two floors with a rooftop garden above it. Vizion was completed in 2009, whilst the following year saw the completion of the 9-storey Pinnacle office development further west along Midsummer Boulevard from the Hub, closer to the railway station. The latter is distinctive for the slanted roof on its tallest section. This district is defined by Saxon Gate (Saxon Street, V7) to the north-east, the West Coast Main Line (and the adjacent A5) to the south-west, Portway (H5, A509) to the north-west and Childs Way (H6) to the south-east. The core retail district is further delimited by Silbury and Avebury Boulevards, with civic and office developments outside the Boulevards. The main feature of the district is the Milton Keynes Central railway station (an inter-city stop on the West Coast Main Line), one of the five stations serving Milton Keynes. Coach services operate from here as well as from the Milton Keynes coachway next to junction 14 of the M1 motorway. Services include the Stagecoach X5 service that replaces the Varsity Line, which links Milton Keynes with Oxford in the west (for connections to the west and Wales) and Cambridge in the east; and the 99 service to Luton Airport, operated by Stagecoach. The station building houses commercial office lets and food outlets, and the Station Square development includes further office lets and retail outlets. The bus interchange bays are located at the railway station forecourt. (The former central bus station is located opposite the railway station but has not been operating as such since 1997. The upstairs level of the bus station (formerly a night club) accommodates a young peoples' facility, 'the Buszy'. This includes an award-winning covered "urban" skate-boarding area, which has attracted international 'skaters' and film crews). The former England National Hockey Stadium was located on a site to the north of the station, surrounded by a number of important retail units. Having been vacated, this was demolished in early 2010 and the site redeveloped as 'the 'Quadrant:MK', the national 'centre' for Network Rail. To its south there is another leisure and retail area – the Leisure Plaza, notably the Planet Ice Arena (home of Milton Keynes Lightning) and what was another ten-pin bowling alley. Central Milton Keynes is a civil parish, bordering (clockwise from north) Great Linford, Campbell Park, Loughton, and Bradwell. The parish was created in 2001, and had a population of 2,726 according to the 2011 census. For the 2001 Census, the Office for National Statistics designated an urban sub-area (map) that it called "Central Milton Keynes". This was far bigger than either the district or the parish. Since the 2011 Census, this nomenclature is no longer used. Locations around Central Milton Keynes were used for the movie Superman IV: The Quest for Peace, where it played the part of the United Nations building. Recognisable locations include Milton Keynes Central, CBX and the Argos (now Home retail Group) building on Avebury Boulevard. Milton Keynes for a more general description of the amenities of the wider area. ^ Jacob, Sam (22 May 2015). "Derek Walker obituary". The Guardian. Retrieved 3 March 2019. ^ Barkham, Patrick (3 May 2016). "The struggle for the soul of Milton Keynes". The Guardian. Retrieved 11 May 2016. ^ "Out and About". www.roomsmiltonkeynes.co.uk. Archived from the original on 13 January 2016. Retrieved 26 August 2015. ^ Guardian Unlimited | Search |"Milton keynes gallery"
^ Milton Keynes does not have City status in the United Kingdom and remains formally a town. However it was planned to be a city in scale and the term 'town' is reserved locally for its constituent and adjacent towns – Bletchley, Stony Stratford, Wolverton, Newport Pagnell, Woburn Sands, and Central Milton Keynes itself. 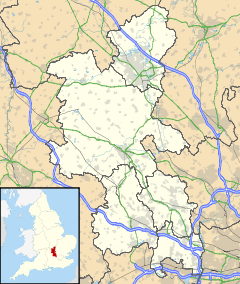 ^ Oakhill, at the western border with Aylesbury Vale, is slightly higher. "Understanding Historic Parks and Gardens in Buckinghamshire : The Buckinghamshire Gardens Trust Research & Recording Project : Central Milton Keynes (CMK)" (PDF). Buckinghamshire Gardens Trust. 1 June 2017. Retrieved 3 March 2019. Wikimedia Commons has media related to Central Milton Keynes. This page was last edited on 10 March 2019, at 19:31 (UTC).